The three brightly illustrated books in this series are designed to draw 3 to 6 year-olds closer to God every day through Bible readings, stories and prayers. Parents and children alike will grow to know and love Squiggle and Splodge, Gloria Glitter Pen, Denzil the Pencil, Charlotte Chalk, Marco Marker, Waxy Max, Philippa Felt Pen and their pet Sharpie. Each day has a Bible reading, a prayer and a story to help understand and apply the day's main thought. Each individual book contains a mix of Bible stories and stories focussed on the Pens' daily lives, each linked to the subject of the Bible passages. God's Love explores how God expresses His love to us and how we can share His love with others. The topics are: 'Loving Each Other', in which Pens try to make friends with Someone New; 'Hannah's Promise - For the Love of God', focussing on the story of Hannah dedicating her son to the Lord; 'Blessings from God', a look at the Beatitudes; and, 'Miracle Meal - Five thousand for supper', Jesus shows His love for people and a young boy shares his food. About "God's Love (Pens Daily Devotions For Small People Series)"
This is the third set of three books of our exciting and beautifully illustrated full-colour Bible-reading resource for 3- to 6-year-olds - created to draw young children closer to God every day through Bible readings, stories, and prayers. 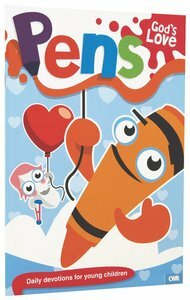 The loveable Pens characters who bring the Bible to life are: Squiggle & Splodge, Gloria Glitter-pen, Denzil the Pencil, Charlotte Chalk, Marco Marker, Waxy Max, Philippa Feltpen and Sharpy. Each day has a Bible reading, a prayer and a story to help understand and apply the day's main thought: each individual book contains a mix of Bible stories and stories focused on the Pens' daily lives, every one linked to the subject of the Bible passages. Creative and fun, these daily Bible devotions for young children will help them to apply God's Word in a relevant way to their lives. "God's Love" explores how God expresses His love to us and how we can share His love with others. The topics are: 'Loving Each Other', in which Pens try to make friends with Someone New; 'Hannah's Promise - For the Love of God', focussing on the story of Hannah dedicating her son to the Lord; 'Blessings from God', a look at the Beatitudes; and, 'Miracle Meal - Five thousand for supper', Jesus shows His love for people and a young boy shares his food.